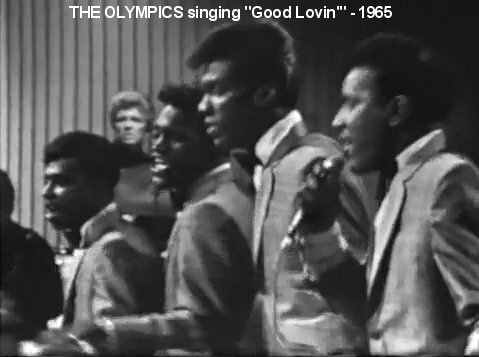 The Olympics were one of the few 50s groups that continued a string of hits into the 60s. Concentrating on raucous dance numbers (somewhat like a group version of Chubby Checker), they were even the originators of a #1 song (alas, however, not for them). Walter Ward, a mainstay of the group for 50 years, was born in Mississippi and sang gospel with his father and three uncles (as the Ward Brothers). In the early 50s, the family relocated to Los Angeles, and he met up with his cousin, Eddie Lewis, who had also come to L.A. from Mississippi. While at Willowbrook Junior High School, Walter and Eddie (both tenors) formed the West Coast Gospel Singers (with James Lloyd and Walter's uncle, Jimmy Ward). 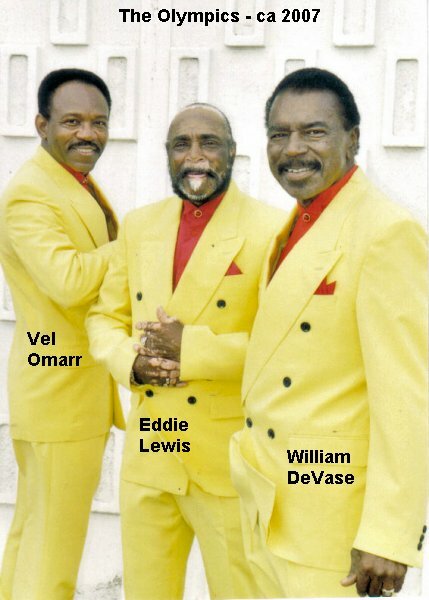 Then Walter and Eddie started attending Centennial High School in Compton and, in 1954, formed an R&B group called the Challengers. The other members were pianist Marcus Banks, a second tenor named Nathan, and baritone Freddy Lewis. One day, at a talent contest, the Challengers met Charles Fizer and Walter Hammond, and, when they decided that it would be more advantageous to join together rather than compete, Charles and Walter replaced Freddy and Nathan. 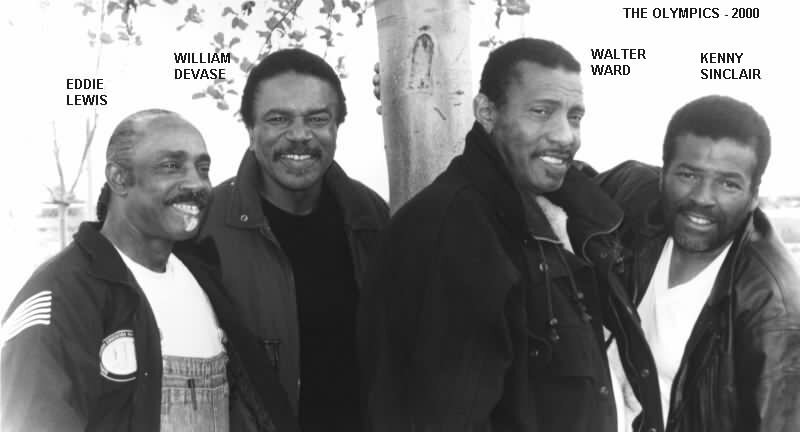 Therefore, when the dust had settled, the Challengers were: Walter "Sleepy" Ward (lead), Eddie Lewis (tenor), Charles Fizer (baritone), Walter Hammond (baritone), and Marcus Banks (piano). They didn't have many gigs (mostly local record hops and clubs), but they had fun singing in the hallways and bathrooms, as well as on Compton's street corners. 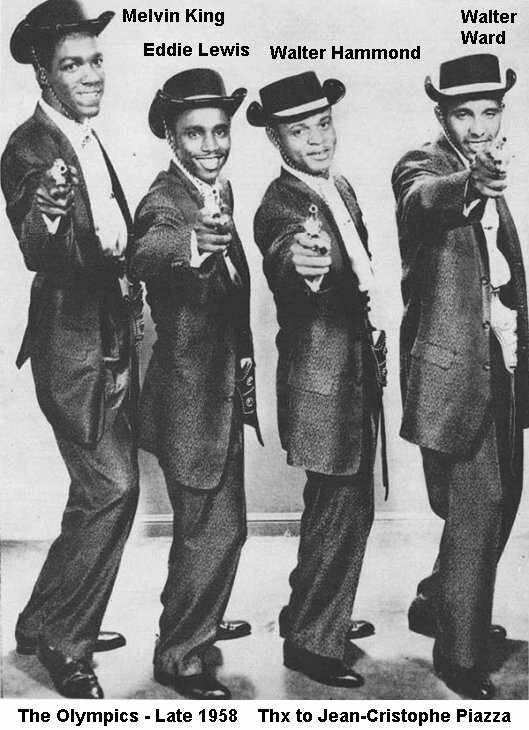 Initially, Jesse Belvin was the main influence on the group; later on, they admired the Spaniels and the Dells. In 1956, as a result of appearing on a television show, they were offered a recording session by Joe Fornis, owner of Melatone Records. 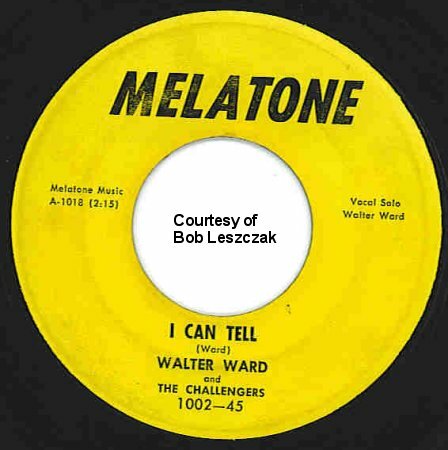 The Challengers only cut a single record for Melatone (the ballad "I Can Tell," backed with the vaguely Latin-ish "The Mambo Beat," led by Charles Fizer), but at least they were on their way. However, they found out that there was another group calling itself "The Challengers," so they renamed themselves "the Olympics." (Actually, since 1956 was an Olympic year, it's surprising that there weren't lots of other Olympics groups.) Their recording career was put on hold for almost two years while they practiced and practiced. In 1958, their idol, Jesse Belvin, introduced them to John Criner, who became their manager. (Criner, a former singer who recorded "Sugar Mama Blues" in 1946, owned the Shade and Spot labels.) He got them a contract with Sy Aronson, Joe Greene, and George Brown's Demon label (which was distributed by Liberty Records). The a&r men at Demon, Fred Smith and Cliff Goldsmith, were also songwriters, who had written a little ditty called "Western Movies." "Western Movies," their very first Demon release in June 1958, shot up to #7 on the R&B charts as well as #8 on the more prestigious Pop charts. Even though no one seemed to be able to make out all the lyrics, the song was a natural, as there were seemingly dozens of westerns on TV that year. The song dealt with the singer's frustration in trying to pry his girlfriend away from the television (he simply can't compete with TV westerns for his woman's affection). While the group's first record (as the Challengers) had reflected a more standard R&B approach, "Western Movies" (which mentions, among others, Wyatt Earp, Cheyenne, Wagon Train, Jim Bowie, Sugarfoot, Maverick, and Broken Arrow) was more in a Coasters vein. The flip, "Well! 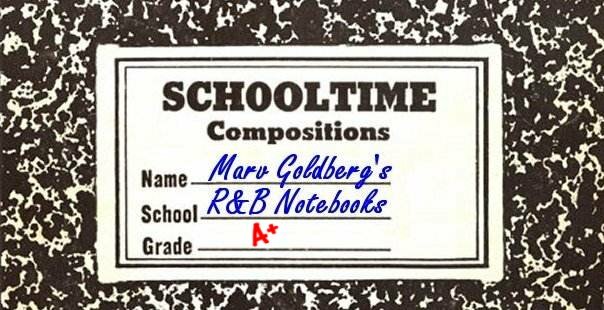 ", was a strained, not particularly interesting song. Shortly after "Western Movies," Charles Fizer left for a while, and was replaced by Melvin King. 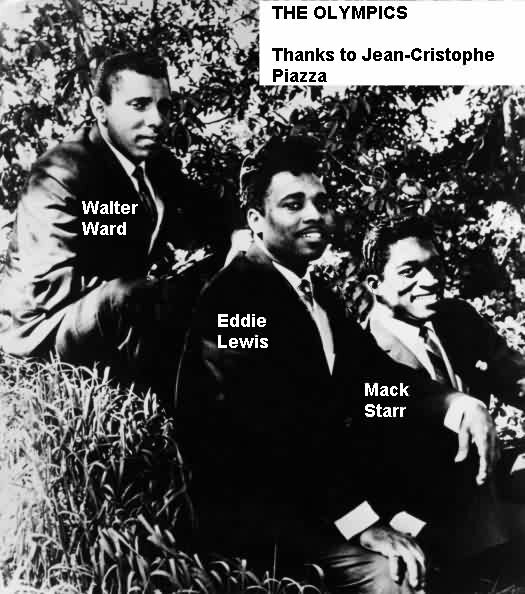 Their next release was "(I Wanna) Dance With The Teacher" (in October 1958), the first of the Olympics many dance numbers (if we don't count the Challengers' "The Mambo Beat"). While it should have had a strong showing after "Western Movies," it only reached #71 on the Pop charts. It's flip was "Ev'rybody Needs Love" (a rare ballad by the guys). Their third, and last, Demon record was "Your Love"/"Chicken." Released in January 1959, it didn't chart at all. "Chicken" was neither a dance nor a food, but all the singer's friends commenting on how cowardly he was. Later that year, both of Demon's a&r men, Fred Smith and Cliff Goldsmith, left the company to work for Richard Vaughn's Arvee ("RV") Records; the Olympics went with them. At this point, Charles Fizer had returned, replacing Melvin King. However, Walter Hammond subsequently left, to be replaced by bass Thomas Busch (for one record). 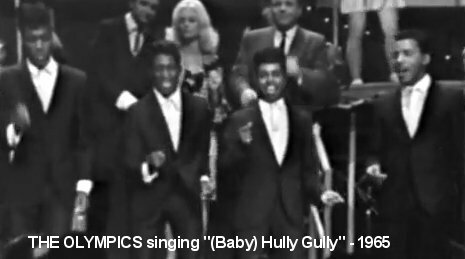 With "(Baby) Hully Gully," the Olympics once again had a hit with a dance number. The follow-up, "The Slop," (released in April 1960) was intended to be in the same mold (sounding suspiciously like "Hully Gully"), but DJs flipped it over and made a hit out of "Big Boy Pete" instead. (This song, originally recorded in 1959 by Don & Dewey, was, of course, the model for Jim Croce's "Bad, Bad Leroy Brown," and featured the duet lead of Eddie Lewis and Charles Fizer.) "Pete" climbed to #50 on the Pop charts, and all the way to #10 on R&B. By the time they'd recorded "Big Boy Pete," Thomas Busch was gone and Melvin King had returned to the group. Then it was back to the dance: August 1960 saw the release of "Shimmy Like Kate." This re-working of 1923's "I Wish I Could Shimmy Like My Sister Kate" reached #42. Its flip was "Workin' Hard," with another Coasters-type arrangement. Their next release, in November, was the #47 hit "Dance By The Light Of The Moon," a real oldie. It was based on 1944's "Dance With A Dolly," which had, as its origin, "Lubly Fan" (better known as "Buffalo Gals"), an 1844 minstrel song, attributed to Cool White and his Serenaders. On the flip was "Dodge City" (another Western epic which sounds like Eugene Church's "Pretty Girls Everywhere" meets the Coasters). In 1960, Arvee issued an Olympics LP called Doin' The Hully Gully. It had some of their hits, as well as previously-unreleased tunes: "(Baby) Hully Gully," "Big Boy Pete," "Stay Away From Joe," "The Slop," "What'd I Say?," "Boo-Dee Green," "Private Eye," and "Dodge City." 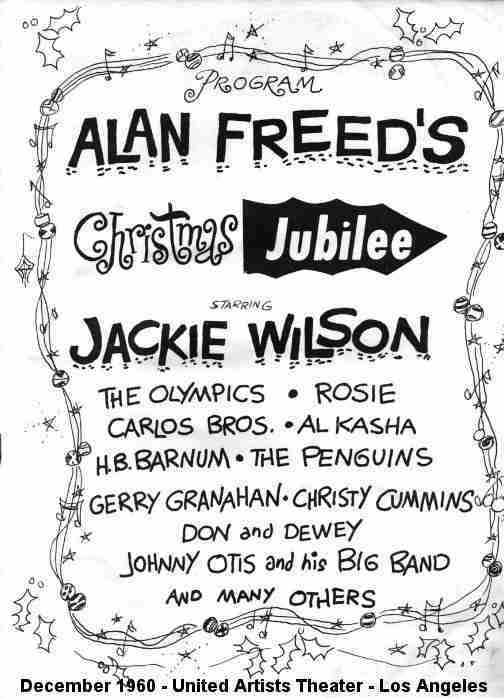 In December 1960, the Olympics were part of a little-known Alan Freed show, probably the last in his "Christmas Jubilee" series. By now, Freed was a DJ on KDAY in Santa Monica, California. Held at the United Artists Theater in Los Angeles, all the acts, with the exception of Jackie Wilson and Gerry Granahan, were from California: the Penguins, Johnny Otis, H.B. Barnum, Don & Dewey, the Carlos Brothers, Al Kasha, Rosie Hamlin, and Christy Cummins. 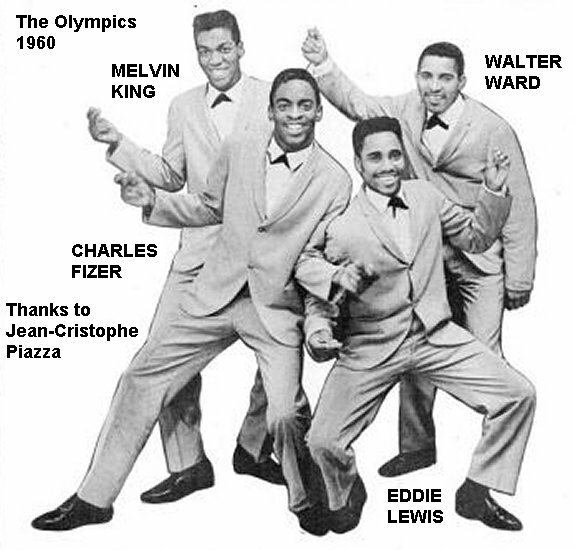 The Olympics started 1961 with the Coaster-ish "Little Pedro" (including stuttering sax), which only made it to #76. The flip, "Bull Fight," wasn't even by them (it was an instrumental by Cappy Lewis), but it tied into the bullfight theme of "Little Pedro." 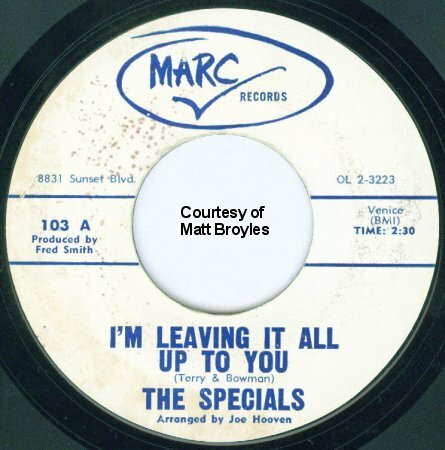 This was followed by May's "Dooley" (a Coaster-ish tune reputedly about Tom Dooley's brother), which peaked at #94 (the flip was the ballad, "Stay Where You Are"). However low on the charts they were, these were still hits, so in May, George Brown's Titan Records issued some old Demon Masters: "Chicken" and the never-before-released car song, "Cool Short." (I doubt I ever heard "Cool Short" when it was out, and probably would never have known that a "short" referred to a car. When the word was used in the Videos' "Trickle, Trickle," I had no idea what they were talking about.) George Brown had been part owner of Demon so he either contracted with them to release the Olympics' sides or had taken them when he left to set up Titan in July 1959. There was another Arvee LP in mid-1961. Called Dance By The Light Of The Moon, it contained: "Dance By The Light Of The Moon," "Workin' Hard," "Big Chief Little Foot," "Stay Where You Are," "Little Pedro," "I'll Never Fall In Love," "Dooley," and "Shimmy Like Kate." Two other Arvee artists were also represented on this album: the Robins' 1960 entry, "Just Like That," and the Marathons' (who were, of course, the Vibrations) "Peanut Butter." October 1961 saw them returning to dance music with the doubled-sided "The Stomp" and "Mash Them 'Taters." Neither side charted. 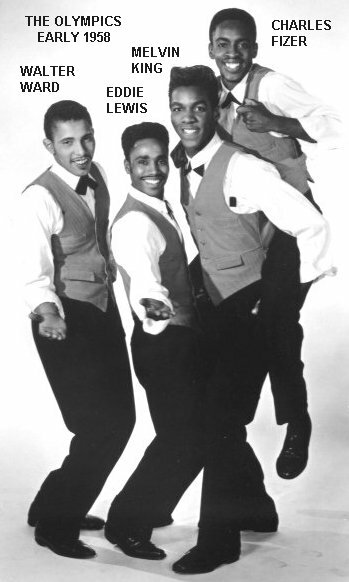 The same was true of the follow-up, another double-sided dance extravaganza: "Twist" (issued to compete with Chubby Checker's reissue of the song)/"Everybody Likes To Cha Cha Cha" (a remake of the 1959 Sam Cooke tune). Their last Arvee single was released in April 1962: "Baby It's Hot" (which seems to have the melody of Henry Strogin & the Crowns' "My Aching Feet") and "The Scotch" (another dance record that was similar to "Hully Gully"). Once again, there was no chart action. There was one final Arvee LP in 1962. Called Party Time, it had: "Mash Them 'Taters," "The Stomp," "Hoochie Coochie Coo," "Everybody Likes To Cha Cha Cha," "Pony Time," "Party Pooper," "The Scotch," "Madison Time," "Save The Last Dance For Me," and "The Twist." So with lots of records and no recent hits, the Olympics once again turned to Sy Aronson. Demon Records was defunct, but he now ran the Tri Disc label, which he owned along with singer Effie Smith. In January 1963, the Olympics appeared on Tri Disc with another dance number, "The Bounce." The flip, "Fireworks" (one of my favorites, in spite of the cheesy sound effects), got a lot of airplay in New York (it was a Murray The K "Pick Hit Of The Week"). Aronson may have made a deal with Liberty Records (which, if you'll remember, had distributed Demon) to reissue "Western Movies" (in January 1963) to coincide with his new release. "The Bounce" was another chart hit for the Olympics, reaching #40 on the Pop charts and #22 R&B. Trying to recapture their bouncin' glory, they released the similar-sounding "Bounce Again" in August (backed with "A New Dancin' Partner"), but it didn't chart. There was a Tri Disc LP in the fall of 1963, entitled The Bounce. It featured that tune plus: "Do The Slauson Shuffle," "Dance What You Wanna," "Nitty Gritty," "Dancin' Holiday," "Hully Gully Mash," "New Dancin' Partner," "Loop De Loop Limbo," "The Baker," "Groovin'," and "Bounce Again." November saw "The Broken Hip" (yet another dance record, which sounded suspiciously similar to "The Bounce") backed with "So Goodbye" (a silly teenage angst number). These were two more non-charters. The Olympics did two more records for Aronson, this time on his Duo Disc label. Both released in 1964, the first of these was "The Boogler" (Parts 1 and 2) in April. The other was "Return Of Big Boy Pete" (more mayhem, with Pete getting even) backed with "Return Of The Watusi" In September. With the Olympics out there releasing a slew of recordings, Arvee dug into its vaults and issued "What'd I Say" (parts 1 and 2) in 1964. At the end of 1964, the Olympics broke with Aronson and went on to Warner Brothers Records, where they had a January 1965 release on Warner's Loma subsidiary: "Raining In My Heart"/"I'm Comin' Home." In February, the somewhat mysterious "My Girl Sloopy"/"Here I Stand" was released on the Jerden label by "John Henry and the Olympics." Whoever this remake of the Vibrations hit was by, it wasn't by "the" Olympics. The next Loma release was March's "Good Lovin'." While this only reached #81 on the Pop charts, the Young Rascals would take it to #1 almost exactly a year later. The flip was an instrumental called "Olympic Shuffle" (which was actually the instrumental tracks to the Blossoms' "Latin Boy Shuffle"). In April 1965, Arvee once more raided the vaults to release the ballad "Stay Where You Are." Its flip was "Big Boy Pete '65" (which was a strange title because it was the original 1960 cut, not a remake). The final Loma release was in July 1965: "Baby I'm Yours"/"No More Will I Cry." The title of the latter song wasn't particularly prophetic. On August 14, during the Watts riots, Charles Fizer was shot to death while on his way to an Olympics rehearsal. If that wasn't enough, Melvin King's sister was also killed the same day. Melvin did one more performance with the group and then left them for good. 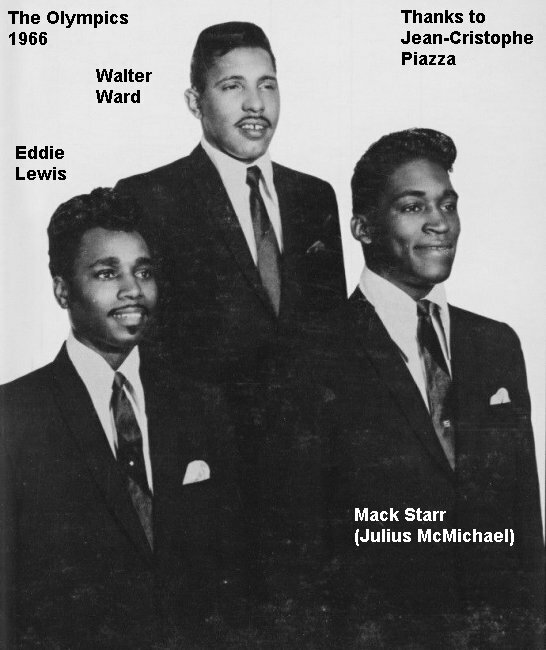 Walter Ward and Eddie Lewis replaced Charles Fizer and Melvin King with Mack Starr, who's probably better known as Julius McMichael, high tenor lead of the Paragons. He'd relocated from New York to California in the 60s and ended up staying with the Olympics for 15 years. The group continued on as a trio, occasionally using a female chorus. In January 1966, the Olympics recorded for Randy Woods' Mirwood label. Their first release was "Secret Agents"/"We Go Together (Pretty Baby)." "Secret Agents" (which should have been big due to the James Bond craze) was re-released in March, this time with "Mine Exclusively" as the flip. "Exclusively" just broke the top 100 (#99) on the Pop charts (although it made it to #25 on the R&B charts). Their next Mirwood release was a remake of "Western Movies," backed with another dance record, "Baby Do The Philly Dog." "Dog," released in September 1966, turned out to be their last chart hit, peaking at #63 (#20 on the R&B charts). There were three more singles on Mirwood: a remake of "The Bounce," coupled with "The Duck"; "The Same Old Thing," backed with "I'll Do A Little Bit More"; and "Hully Gully," paired with "Big Boy Pete" (two more remakes). The Olympics would never have another national hit. In 1967, Mirwood released an LP called Something Old, Something New that contained all of their single recordings except for "The Same Old Thing.". They next hooked up with J.W. Alexander, a business associate of Lou Rawls and the late Sam Cooke. He had them record a couple of songs ("Lookin' For A Love" and "Good Things"), which he subsequently got released on Parkway (in February 1968), but they didn't sell. Then there was a single release on the Jubilee label in September 1969: "The Cartoon Song," backed with "The Things That Made Me Laugh." Once again, there was little sales action. In May of 1970, the Olympics did some more recording for Warner Brothers. This time the record was released on the parent label: "Please, Please, Please" (the James Brown song)/"Girl, You're My Kind Of People." 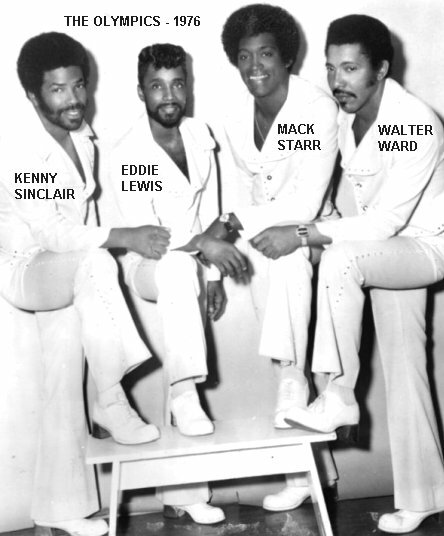 Then, in 1971, after having been a trio for about five years, they added tenor Kenny Sinclair, formerly of the Six Teens; all four members were now tenors. That same year, they released "There Ain't No Way"/"3 Billion People" on the Songsmith label. There was an Olympics release on MGM's Pride subsidiary in February 1973: "The Apartment"/"Worm In Your Wheat Germ" (it was also issued on the parent MGM label the same month). 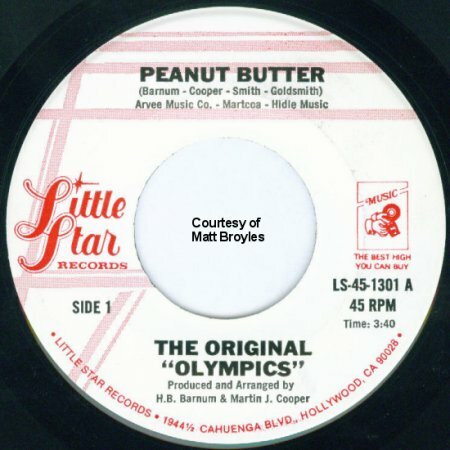 Sometime in the mid-70s, Little Star released "Peanut Butter" (by The Original "Olympics"; it's somewhat suspicious that only "Olympics" is in quotes). H.B. Barnum produced the session along with Martin Cooper. (Both of them had written "Peanut Butter" back in 1961; remember that they'd had the Olympics in mind to record it.) The group on the record is probably not the Olympics, however, but whatever singers Barnum could round up for the session; in spite of that, it's really very good. The flip, "Creamy Crunch," is an instrumental (also written by Barnum and Cooper). I'm not sure when the record came out, but the sound of "Creamy Crunch" owes a lot to Van McCoy's "The Hustle," which didn't chart until the spring of 1975, so it couldn't have been before then. A 1976 entry was "Don't Get Down (On Yourself)" on the California Gold label. One side was mono; the other side stereo. In June 1981, tragedy struck the Olympics again, as Mack Starr was killed in a motorcycle accident. The guys got bass William DeVase to replace him (it had been a long, long time since there had been a bass in the group). Back in the early 60s, William had been in the Elements/Elgins with Kenny Sinclair. The combination of Walter Ward, Eddie Lewis, Kenny Sinclair, and William DeVase was together for over 20 years. In all that time, the group made a single record, released on Mac Winn sometime in the 80s: "I Feel Your Love (Comin' On)"/"Papa Will." 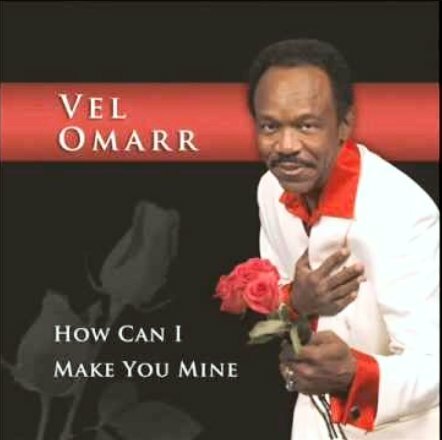 When Vel Omarr released a CD in 2007 (How Can I Make You Mine on his own VOS label), he used the Olympics to back him on two tracks: "Lover's Deja Vu" and "Stay Where You Are". If you wanted to dance in the 60s (and it seemed like everyone did), you could have done a lot worse than to get hold of a bunch of Olympics records. The group had an infectious sound, and, because they managed to hook into a couple of crazes (westerns and dances), they had over a dozen chart hits. Special thanks to Freda Sinclair, Phillipe Chivot, Matthew Broyles, Jeff Beckman, Heikki Suosalo, and Ferdie Gonzalez. 101/102 I Feel Your Love (Comin' On)/Papa Will - 198?